Astros starter Charlie Morton (15-3) frustrated Arizona hitters, who struggled to get anything off the ground against him early. Morton was perfect through three innings before the Diamondbacks scored on a sacrifice fly from David Peralta in the fourth to pull to 2-1. 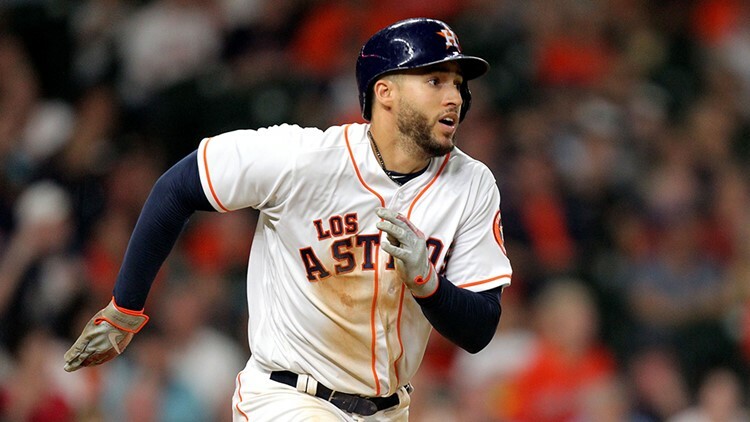 HOUSTON — George Springer had four hits and scored three runs to help the Houston Astros beat the Arizona Diamondbacks 10-4 Saturday night and extend their lead in the American League West. After struggling to get hits in a 4-2 loss to the Diamondbacks the previous night, the Astros managed 12 hits - including 10 singles - and drew seven walks in the bounce-back win. Coupled with Oakland's 7-5 loss at Tampa Bay, the Astros extended their lead to 3 1/2 games over the Athletics in the division with 14 games remaining. Springer, who finished 4 for 5, did not show any possible lingering shoulder discomfort after exiting Friday's loss early as a precaution following a diving attempt in the field. The Astros put together a three-run rally in the fourth inning with a string of singles from Springer, Jose Altuve, Marwin Gonzalez and Yuli Gurriel. Gonzalez's hit drove in two, and he advanced to third on Gurriel's dribbler into right field and came around to score when the ball went under the glove of right fielder Steven Souza. That chased Zack Godley (14-10), who gave up five runs and seven hits, while matching a season-high with six walks in 3 2/3 innings. He lost his third straight start, failing to make it to the sixth inning for the fifth time in his last six outings - going 1-4 in that stretch. Ketel Marte homered off Morton in the fifth to cut Houston's lead to 5-2. The Astros answered with another three-run inning in the sixth, again using exclusively singles from Springer, Alex Bregman and Gurriel to push the lead to 8-2. They added two more in the seventh on a two-run double from Altuve. Eduardo Escobar hit his 22nd homer of the year in the eighth inning into the right-field upper deck off Chris Devenski to make it 10-3. Marte's RBI double in the ninth capped the scoring. Jose Reddick homered, his 14th, off Godley in the second inning to get the Astros on the scoreboard first, and Gurriel made it 2-0 with run-scoring grounder in the third. The Astros left the bases loaded in the first and third innings and stranded 10 runners in the game. Diamondbacks: Arizona placed RHP Clay Buchholz (right elbow flexor strain) on the 60-day disabled list. Buchholz, 34, was 7-2 with a 2.01 ERA in 16 starts for Arizona this season and was a late scratch from his last scheduled start Thursday in Colorado. RHP Randall Delgado was recalled from Triple-A Reno. Astros: RHP Lance McCullers Jr. (forearm strain) pitched a bullpen session on Saturday at the Astros' spring training facility in Florida, facing one hitter and mixing in all of his pitches, Astros manager A.J. Hinch said. McCullers, who has been out since Aug. 4, will have a similar session on Tuesday. Diamondbacks: RHP Zack Greinke (14-9, 3.11 ERA) is 7-3 with a 2.75 ERA in his last 11 road starts. In 10 career starts against Houston, Greinke is 6-2 with a 2.24 ERA. Astros: RHP Justin Verlander (15-9, 2.72 ERA) will close out Houston's three-game series against Arizona on Sunday. Verlander is two strikeouts behind teammate Gerrit Cole (260) for the American League lead, and just 11 shy of his career high of 269 in 2009.